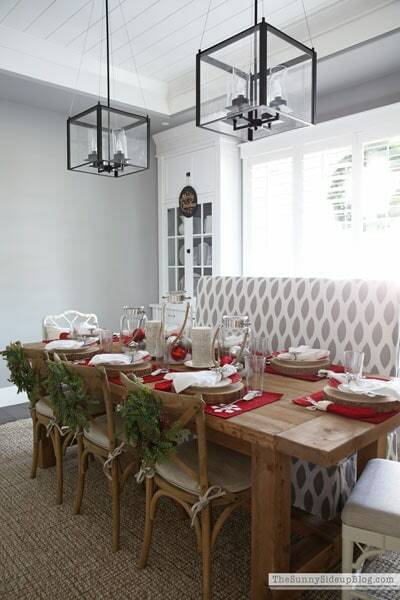 I am so excited to be sharing some of our home decorated for Christmas and to start with our kitchen table all set for a holiday meal. If you are joining me from Ann On Sutton Place, thank you so much for coming along. I have learned a thing or two about decorating a table for “the blog” versus creating a table that my friends and family really can sit at and enjoy a meal that is also pretty and fun. The key element – keep it simple. I almost always uses dishes, flatware and glasses that go in the refrigerator. My one splurge is cloth napkins that we throw in the washing machine. Recently, I have really been liking usable recyclable table runners as my base. It keeps a neutral place to start with, in this case brown kraft paper, and it is a really simple clean up which is always important to me. I knew I wanted to use this beautiful blue velvet ribbon I found and that I wanted to keep it casual and fun with a candy cane. I love fresh evergreens on the table as well so I have tucked some in the ribbon around the napkin, along with the candy cane. Then I hit my stash of vintage blue bottles and placed them down the center of the table. I added some simple evergreen clippings, added some vintage ornaments and tied some red baker’s twine around the neck of the bottles and jars. The final step for the centerpiece was to place our Joyeux Noel soy tea lights down the center. I used our white plates, simple flatware and wine glasses to finish the simple and causal look. It may be simple, but it is pretty and sparkly and the type of table where people will hopefully linger and make time with friends and family the biggest focus of the season. But the best part, is it is not just me. 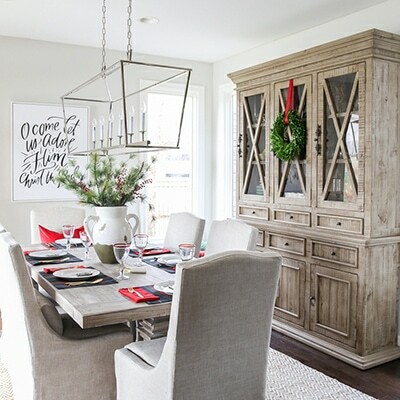 I have teamed up with a whole group of lovely ladies, hosted by Design Enthusiasm, today so you can tour all of our ideas for creating a holiday entertaining space. Next on your stop is Life On Virginia Street. Your table is beautiful, Laura. I love the blue, so unexpected but perfect at this time of the year. And the white dishes make those candy canes sparkle. . . I also wanted to tell you that yesterday I received what I ordered from your shop. It was the first time I ordered anything, and I couldn’t be happier. First, the package came within a week of being ordered, even though you didn’t ship anything over the Thanksgiving weekend. Then it was packed with such care, in a sturdy box, lots of packing material to keep it safe. I ordered a galvanized metal barn, and the quality is exceptional. I didn’t know what to expect, and I was pleasantly surprised by how perfect the barn is, a heavier metal that stands up without any issues. It’s now on my shelf with other metal pieces, some white sparkly lights poking out from some of the windows. Your shop is the BEST, and I will be telling others about your website. Hoping you and your family have a great Christmas and prosperous new year. 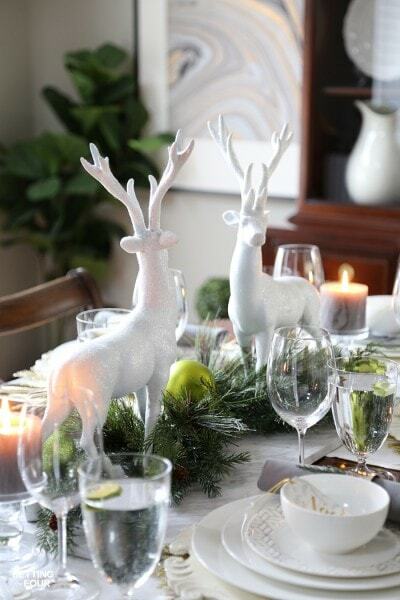 Your table is classic and so pretty…what a relief to be able to sit and enjoy it when Christmas is finally here. Happy holidays! 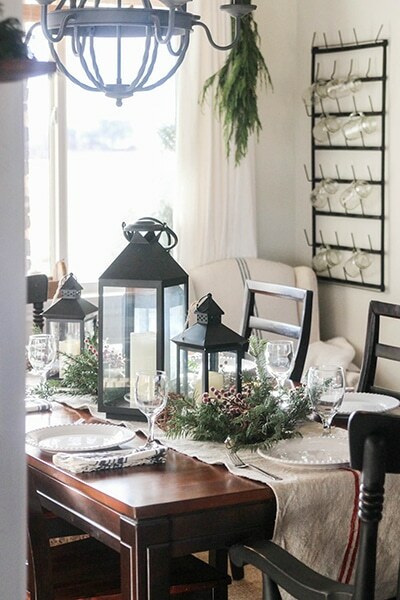 Love the row of vintage bottles in your tablescape Laura! So pretty! Happy holidays! 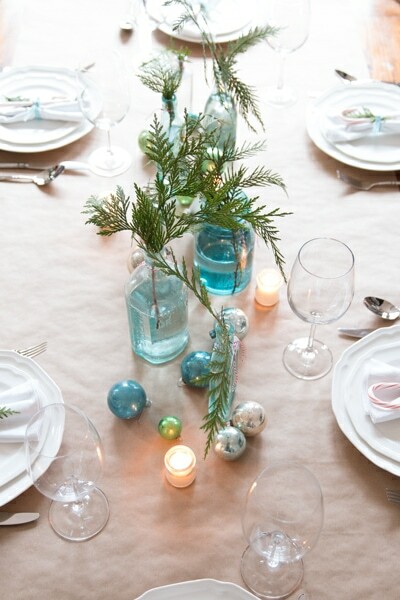 I love this simple and lovely tablescape…such a relief from all the “overdone” I see elsewhere…thank you! always so classy Laura! you really have a gift. simple yet so cozy. love it! hey girl love your table! So pretty! So beautiful, Laura! I love the greenery and the blues. Happy holidays. Oh my goodness! 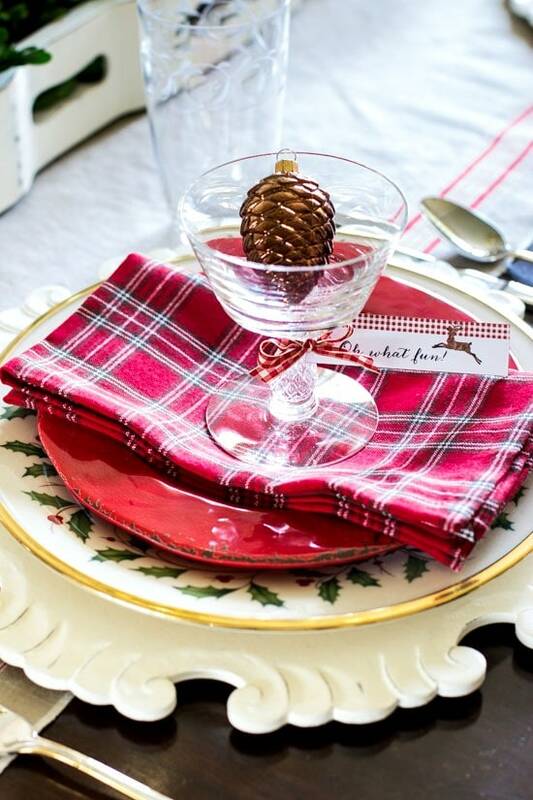 I adore your Christmas tablescape! I’ve got to clear off my dining room table and set it up for Christmas dinner this afternoon. Thanks so much for the inspiration!